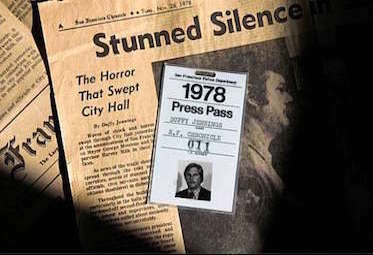 One day in late May 1972, one of my early mentors, Chronicle editor Steve Gavin, came into the city room raving about a new book by New York City fire fighter Dennis Smith. “Report from Engine Company 82” was a gritty diary about life in a Bronx fire station that was answering 700 calls a month. Smith’s vivid account of the busiest fire station in the country was the first of its kind to open the doors – and the public’s eyes – to the life-and-death heroics fire fighters face every time the alarm sounds. Well, what kid didn’t want to be a fireman when he grew up? 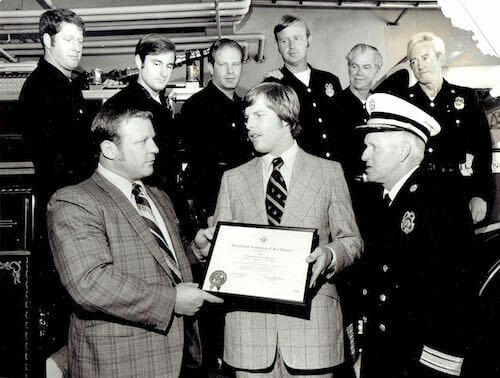 With then-Chief Keith Calden’s approval, I took a three-day crash course at the city’s Fire College to learn enough of the basics to keep from getting myself hurt. 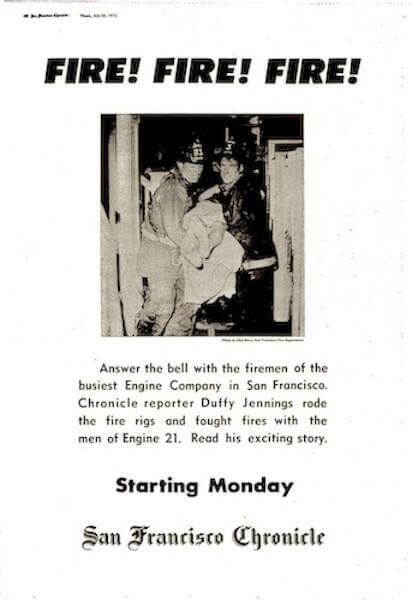 Then I donned a genuine SFFD uniform with an official silver badge, my own turnouts and a distinctive yellow press helmet and joined the crew at Engine Company 21 on Grove Street between Broderick and Baker, then the busiest firehouse in San Francisco. This was the 1972 equivalent of what journalists now call being “embedded.” At first the men of 21 Engine were none too happy to have a reporter in their midst. Gradually I was able to earn their trust by keeping up my end at fires and in the kitchen. The bells hit. Onetwothree. Onetwothreefourfive. Onetwothree. Onetwothreefour. With the last four, a thunderous clatter of wooden chairs and benches. Heavy black boots pound across the linoleum. “Inside for the engine! Chief goes too! Box 3534, Fillmore and McAllister! Everybody! The huge automatic overhead garage door grinds open. Men run down both sides of the pumper, jump on. Seventeen tons of glossy red steel, rubber and hose. Paul guns life into the big diesel. Biff O’Brien, on the back step, gives the go-ahead. Paul jams down the accelerator. Siren. Red lights. The rig bolts out onto Grove street, into the night. Mike Keating grips the handrail on the right side with one hand, snaps up his turnout coat with the other. Paul takes a wide turn at Broderick street. Up the block, tear around the next corner. Down Fulton street jostling through traffic. Two ear-shattering blasts of the air horn drown out the siren. Past Scott street, Pierce, Steiner. Gotta be doing sixty, seventy maybe. Moving van on the right! Swerve! No sweat. Paul pumps the brakes at Fillmore. Two more rigs tear up Fulton from the opposite direction. 14 Engine and 6 Truck. Sirens everywhere. On the fourth floor, at the rear of the building, an orange glow beats against the window. Biff hooks his arm through a loop of “big line,” yanks a 50-foot length off the hose bed and heads for the hydrant. The pumper pulls up to the front of the building. The coupled hose snakes out behind it, flops on the pavement. The Manor Plaza’s outer foyer is boarded. Old campaign posters splashed on rotting plywood sheets. Can’t make a lead from the street. Chief Favilla orders 6 Truck to “ladder” the front fire escape – take the line up from the outside. The men haul the hose up, through a splintered window on the fire floor. Down a pinched hallway, thick with soot and smoke. Mike humps the nozzle to the doorway of the crackling room. The opposite wall is curtained in flame. Another wall is blistered and bubbly, the ceiling scorched. 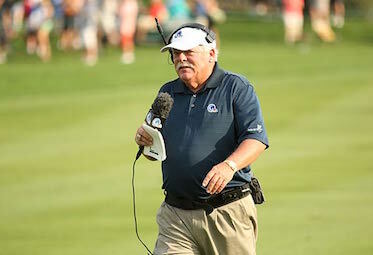 Mike swears at the lifeless hose flaked out behind him. “Charge the line, dammit!” he yells. Outside in the street, a fellow fire fighter with a wrench opens the valve on the hydrant. The hose ripples up the the hall, swollen with water. Sixty gallons a minute. Mike cracks the nozzle open, floods the room. Choking black steam hisses up the walls and ceiling. Cruddy hot smoke belches out in the hall. The truckmen crouch beneath it, coughing, eyes red and runny. Mike, wiping a moustache of black snot from his lip, moves in another two feet. He drives the powerful stream against the window on the blazing wall. The glass explodes, showers the empty lot below. The smoke pours out the window. A smoldering mattress, now a pile of soggy cotton and crusty springs, is visible in the far corner. The fire is out. Mike gives the room a final washdown and shuts down the line. Two truckmen throw the mattress out the window. Others move in with ceiling hooks and axes to pull the walls, checking for hidden fire. Cause of this fire – unknown. “Probable discarded smoking materials,” the official report will say. Someone had been living in the room. No plumbing, no electricity, no heat. Just a mattress, a shirt, a pair of shoes. He tells 21 to “pick up.” Uncouple each length. “Bleed” the water out. Recouple. Feed the hose back onto the engine. Go home. The box – the bells sounding the alarm – hit at 9:07 p.m. Fourteen minutes later, the fire is out. Engine 21 dropped the most line; they are the last to go home. First there, last back. It is after 10 p.m. when the pumper backs into the firehouse. Mike and Biff leave their turnout coats and black leather helmets on the rig and walk back to the kitchen. The coffee is hot and fresh. It is past midnight when Paul climbs the stairs to the second-floor dormitory. He goes to a bank of small open cubicles to get his turnouts – heavy canvas pants “turned out” over clumpy rubber boots. He carefully sets them on the floor beside his bed, boots pointed toward the glistening brass pole in the center of the dorm. His body jerks forward as a box hits on the big bell over his bed, but it is for another company. Receiving an award from the International Association of Fire Fighters after my series appeared in the Chronicle.